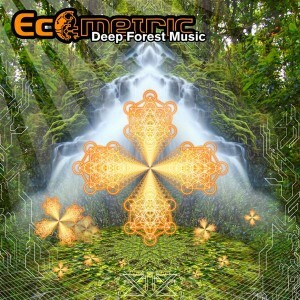 PsyberTribe Records proudly presents its fifth digital release, Deep Forest Music, from the San Francisco Bay area-based artist Ecometric (Brad Stott). This beautifully constructed journey of heightened vibrations serves as a soundtrack for the journey deep into the thick forests of our own consciousness and unprobed regions of the mind. Filled with four amazingly beautiful tracks that flow together as one giant vision, this release is another perfect rendition of consciously colorful and everlasting bliss into the unknown. Ecometric’s haunting melodies and tribal rhythms dance fluidly between spacious psychill and pulsing deep trance. We welcome this artist to our growing roster and are sure that these sounds will please even the most passionate fans of any genre in music. Mastered by Arahat @ Psycircle Studios, San Diego, California, with cover artwork by Sam Farrand. MP3 Download | FLAC Download | WAV Download · Download count: 11,610. Just amazing. very-very good work! This is some of the coolest music I’ve heard. “Lost in thought” is the is my favorite, thank you for making this music and please keep making it!!! This is absolutely brilliant. Since d.ling and burning to disc I’ve been playing it over and over for the past few days. Can’t stop listening to it. The other inhabitant of these shores is also suitably hypnotised by this excellent music. Thankyou ever so much. All of these tracks take me to some beautiful places. Can’t wait to hear more. The Return has amazing movement, I love it. i´ve been waiting to find these fine nature sounds. excelent listening! thank you! Really diggin on this production. Quality stuff all around. Love the album!! Amazing piece of work. It really saddens me how some people cant appreciate this music. Wow, really good work. This sounds so professional. It’s a shame I can’t find other tracks of the artist. Wonderful journey through the Deep Forest… Truly amazing tracks – this release makes me feel one with the nature. 10 stars!!! No words to describe the magic. absolutely amazing work ! i couldnt be more pleased with an album ! thank you so much for sharing such awe-inspiring music with myself and everyone else that is lucky enough to come across this album.